Lopmon is the "twin sibling" of Terriermon, despite having different colors and more horns. While Terriermon is an over-confident sort and tends to make sarcastic remarks, Lopmon is shy and polite. She/He also has an opposing lonesome personality to the excitable Terriermon. Lopmon spoke in an antiquated dialect in the Japanese version that lacked gender-differing pronouns. 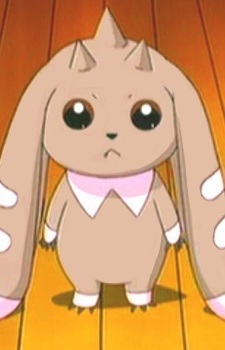 Furthermore, while Terriermon is a dog with rabbit's ears, Lopmon is an actual rabbit digimon.